Too many school libraries in England face cuts or closure with schools increasingly viewing books as obsolete, a teachers' union has heard. One head teacher decided "all reading can be done on iPads," a delegate told the Association of Teachers and Lecturers' annual conference. 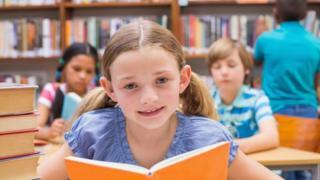 The union voted to lobby for libraries to be included in Ofsted inspections. A Department for Education spokeswoman said that school libraries "played a vital role". Cathy Tattersfield from Derbyshire quoted international evidence suggesting a positive correlation between good school libraries and student attainment. Ms Tattersfield said she had been "shocked" that two secondary academies had "recently closed or attempted to close their libraries and several of them have had their librarian hours or posts cut, mostly in the ex-mining areas of Derbyshire". A survey of 485 ATL members last month suggested a patchy picture on library provision said Ms Tattersfield. "It seems to be feast or famine. "Some secondary provision is fine, cherished and secured," - but others faced reduced opening hours, conversion to e-learning centres, cuts in staff hours, or librarians having been removed or replaced by support staff or teachers. "We identified a third of secondary schools have had cuts of 40% or more since 2010, with 20% redundancies in library staff at their school." Another delegate said his school library, closed last year, had provided a host of benefits to pupils, from paired reading for special needs pupils to introducing able readers to new authors and running a range of enrichment activities. He said the library's books and magazines had been distributed among subject departments. "Lesley Mumbray-Williams whose school dispensed with her services as librarian said a third of the stock had ended up in skips within three weeks of her leaving." Another delegate said the librarian post in their school had not been filled and the library doors were often locked. And nearly a third (32%) said their school did not have a designated librarian to manage the library. A Department for Education spokeswoman said: "We want all children to read widely and well and believe school libraries can play a vital role in fostering that love of reading. "We trust schools to decide on whether to provide and maintain a library service for their pupils."